Exercise is good for us. Yes, of course! However, all athletes (and the parents of young athletes) need to understand the negative effects of exercise, and how to combat them through nutrition. The only nutritional supplement clinically proven to provide the protection that athletes need is... Juice Plus+. This is why Juice Plus+ was the official nutritional support for the German, Swiss and Austrian teams training for the 2012 Olympics in London, as well as many other Olympic and world class athletes around the world. Juice Plus+ is the most thoroughly studied and proven nutritional product in history, and has been tested on elite athletes in several different environments. You can read an overview of all the research here, and more on the exercise research here. 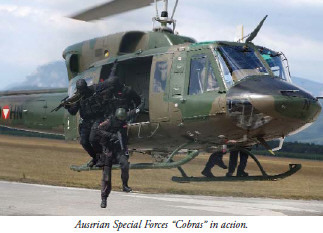 Two articles published in the Journal of Medicine & Science in Sports & Exercise and the Journal of Nutrition, documented an in-depth study of 41 highly trained men (Austrian special forces, aka the 'Cobras') consuming Juice Plus+ for 28 weeks. Juice Plus+ was shown to completely nullify the oxidative stress experienced by these men while exercising to Vo2max80. At the end of the 28 week period, with their workout intensity ramped up to the maximum, their duty hours increased by 45%, and with the accumulative effect of oxidative stress kicking in, compared to the placebo group whose oxidative stress (carbonyl proteins) was measured at 0.9 after exercise and still raised to 0.5 30 hours later, the Juice Plus+ group saw NO change in their levels, which remained at the same, normal 0.3 level as the before exercise baseline (at the start of the 28 weeks). Medicine & Science in Sports & Exercise 2010 - Study findings: This study reports that 4 weeks of pretreatment with a FVC (Juice Plus+) can attenuate blood oxidative stress markers induced by an acute bout of eccentric exercise, but had no significant impact on the functional changes related to pain and muscle damage. In each of these studies, the all-important training effect was supported by Juice Plus+ while dramatically reducing the exercise-induced oxidative stress. The training effect of exercise (aka adaptation) is vital for the athlete to gain in strength and endurance - for example, muscle tissue must break down and be repaired to grow stronger. However, excessive damage caused by exercise-induced oxidative stress is to be avoided if possible. 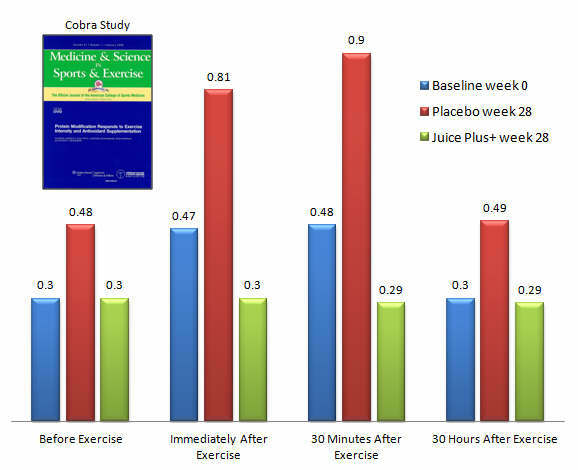 This study again demonstrates what all Juice Plus+ athletes know from their own experience: that those who take Juice Plus+ have less oxidative damage, while fully benefiting from their training. For more on Juice Plus+ Athletes in Europe visit www.juiceplussports.eu.